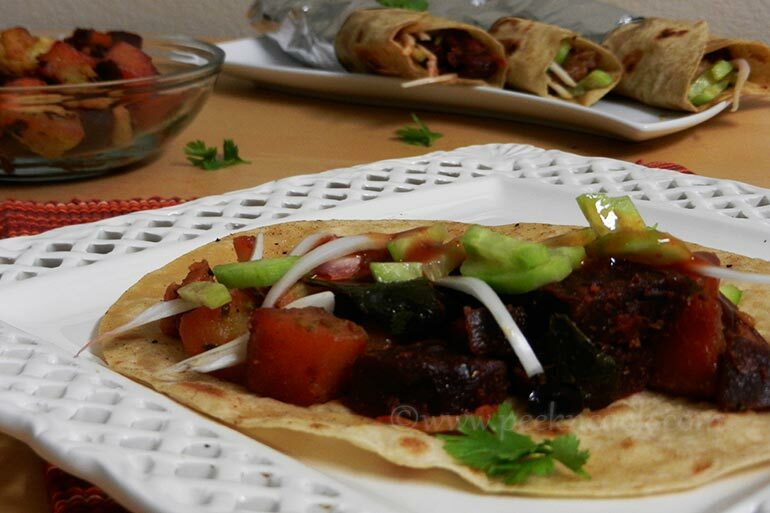 Roll is a kind of wrapped appetizer by wrapping with Indian flat bread or paratha filled with vegetable curries. This rolls are easy to carry and eat. Here I've made this veg roll in a healthy way for the kids. This can fill kids' lunch box in a healthy way. Roll is a kind of wrapped appetizer by wrapping with Indian flat bread or paratha filled with vegetable curries. Take a nonstick pan heat olive oil and add cumin seeds. Fry till cumin seeds start crackle. Now add the chopped ginger and garlic and fry for 1/2 minute. Now add the curry leaf and the chopped vegetables and fry for 2-3 minutes. Add salt , turmeric and mix well. Now add little sugar and some water and cover the pan and cook over low medium heat till the vegetables become cooked enough. When the vegetables are cooked open the lid, higher the heat and dry the curry and keep aside. Now take each parathas and sprinkle some lemon juice all over the paratha add place some vegetables by one side, add some cucumber, chopped onion and ketchup over the vegetables curry and roll the paratha. In this same way make the rest of the rolls. Wrap with aluminum foil to keep the rolls warm. You can make Paneer Rolls in this same way, just replace the Veggies with Cubed Paneer. If you want, you can add chopped lettuce & grated Cheese in the Veggie Roll.